Aerobics | I think therefore I write! I think therefore I write! Me! Writing a blog post on exercise is really an exercise for my mind! Well, I never exercised in past years apart from school days where P.T. was compulsory. I was so petite that I was under the impression; exercise is for those who want to loose weight. How wrong! Our own lifestyles teach us lessons and me, the olive (remember Popeye the Sailor cartoon) kind of looking started gaining weight due to sitting in front of computer all the time. Long hours in cab – office & computer- food- Long hours in cab- food- computer- sleep. Where is walk when you talk? And see, I gained weight! In past 2-3 years I am no more same as I was in college. Now the same people, who used to tell me to eat, started asking me to loose weight! So I joined Yoga class few months back. Yoga is a trend globally from some time. In foreign people pay huge amount to learn yoga and in our country Baba Ramdev is spreading the ‘yog rog’. Yoga has different asanas, meditation and slow movements. You feel the pain in initial days and gradually you become flexible and learn to hold for longer period. As yoga is relaxing and slow, you feel relaxed and calmer after it. Yoga interests every age group- from young soul to souls going to heaven soon. 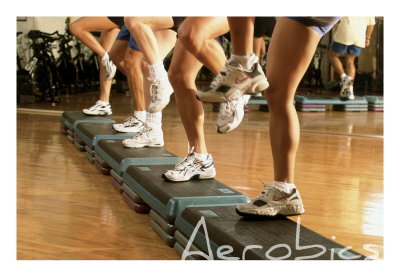 Aerobics! It’s fast (of course fun too) there is music and variations are many and you can do floor aerobics or step aerobics- many types. But yoga also many types like bikram yoga or circus yoga. But there is lots of cardio work, fat burning and muscle definition where as in yoga you are under control of body & mind and soul. And mostly young and middle age group people do aerobics. So after doing yoga for 3+ months I switched to aerobics as I was looking for a morning class in my premises and I find the class very professional, strict trainer and fun filled. BUT legs are hurting like hell and the day you work with dumbbells, your every part is going to ache! After that I can only say, yoga is easy and aerobics is crazy. Yoga is relaxing, aerobics is taxing! Let’s see, will I continue my fitness gaga or sleep & laziness will take over the saga! Image Source: MSU.edu and fitnesscafe.